To provide formation and education for young Lasallians in the Region and a forum for exchange of ideas, and for the development of new initiatives. To serve as a resource for Christian Brothers Conference and the General Councilor for the Region in the areas of Young Lasallian formation and education. To collect and share information relating to young Lasallians and to offer programmatic support where appropriate. To promote and implement initiatives and directives from the ICYL for the continued growth of the Young Lasallian movement in the Region. To undertake those projects and requests issued by Christian Brothers Conference. To assist Christian Brothers Conference and the General Councilor for the Region in furthering the international mission for young Lasallians within the Region. 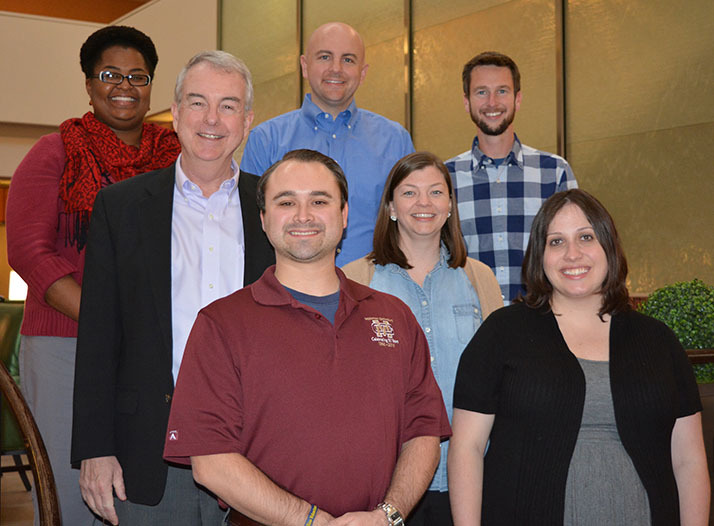 RCYL Members (pictured at top): From back left: Kenenna Amuzie (District of San Francisco New Orleans), Chris Swain (Director of the Office of Lasallian Vocation Ministry), Joe Welling (District of San Francisco New Orleans), General Councilor Brother Timothy Coldwell, FSC (Regional Council of Christian Brothers), Kathleen Swain (Director of Lasallian Volunteers), Denis Block (Midwest District), Sarah Laitinen (District of Eastern North America) Not pictured: Dustin Perry (Midwest District), Christopher Panepinto (District of Eastern North America).